The overwhelmingly enthusiastic reaction of friends to our Yellowstone wolf excursion surprised us. Even strident vegans/vegetarians were ecstatic to learn about our trip. So that got us thinking about why do many humans have a strong penchant for wolves? Is it because of their canine cousins? Is it because they are complex social animals like us? Is it because they travel in packs? Is it because they are rare? or wild? Is it because of their near extinction? Is it because they mate for life? Is it because they are elusive? Our wolf knowledge was limited so we decided to learn more. 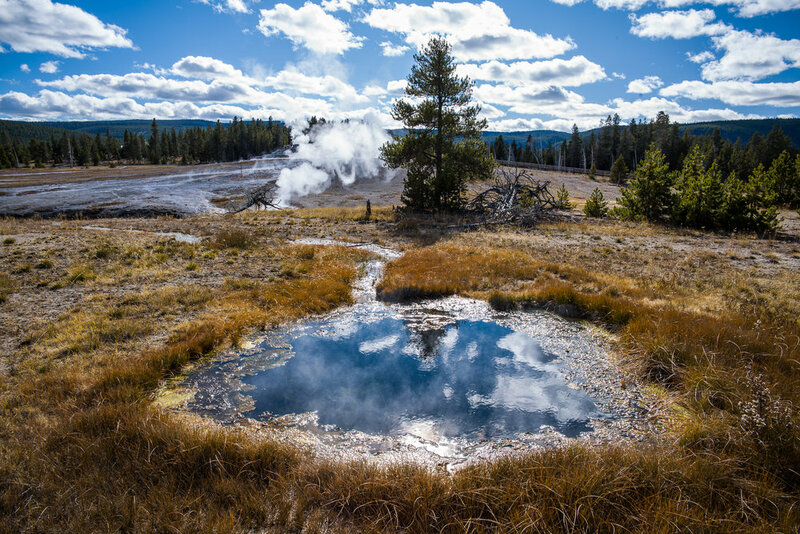 When Yellowstone National Park was created in 1872, it was literally "the wild west." The US government was at war with the Native Americans. The untamed west was dangerous for everyone including the settlers. The battle of the Little Big Horn was fought less than 300 miles away in 1876 and 4 years after Yellowstone became the world's first national park. Wolves were and are carnivorous predators that kill to live. The settlers saw the wolves as a menace to their livestock, family and livelihood. They hunted wolves as a result. During the park's early years there was no protection for wildlife; administrators, hunters and tourists were free to kill any game or predator they came across. The last wolves were eliminated from Yellowstone in 1926 through government predator control programs. Rangers were on payroll to track and exterminate them. However, the lack of an apex predator caused drastic changes to the park's delicate ecosystem. Elk herds grew to unsustainable levels and thus began the destruction of the fragile vegetation in the river valleys due to the growing herds. In Where the Wild Things Were, William Stolzenburg wrote "It was the overly large elk populations that caused the most profound changes to the ecosystem of Yellowstone with the absence of wolves." So in the 1940s, park managers, biologists, conservationists and environmentalists set in motion a campaign to reintroduce the wolf. They hoped to rebalance the park's ecosystem. This program took almost half a century to take root. The 1995 wolf reintroduction into the park's Lamar Valley reignited a debate that continues to this day. Ranches with livestock surround Yellowstone. Ranchers wish to protect their herds. In the 2017 article, "Why We're So Divided Over Saving Wolves" by Simon Worrall, author Brenda Peterson passionately explains, "You’re dealing with a fault line between cultures and, as we know from earthquake studies, fault lines are very volatile and active. On either side, you have people who have a sense of righteousness about their cause. One side, the hunters and ranchers, has been dominant since we began as a country. Now, all of a sudden, you have voices coming from the public, who are often urban and have an environmental passion.” Wolves are the peak predator within Yellowstone's borders. However, when they cross the invisible boundary to ranch lands, the wolf is no longer the big dog. We don't know enough to take a stand on this controversy. It is easy to see the arguments on both sides. 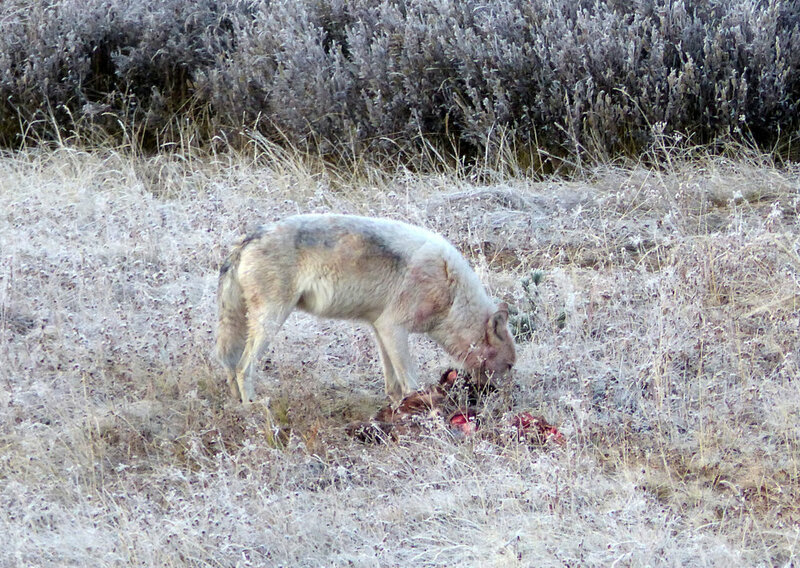 There is evidence the wolves have changed the ecosystem in Yellowstone for the better. 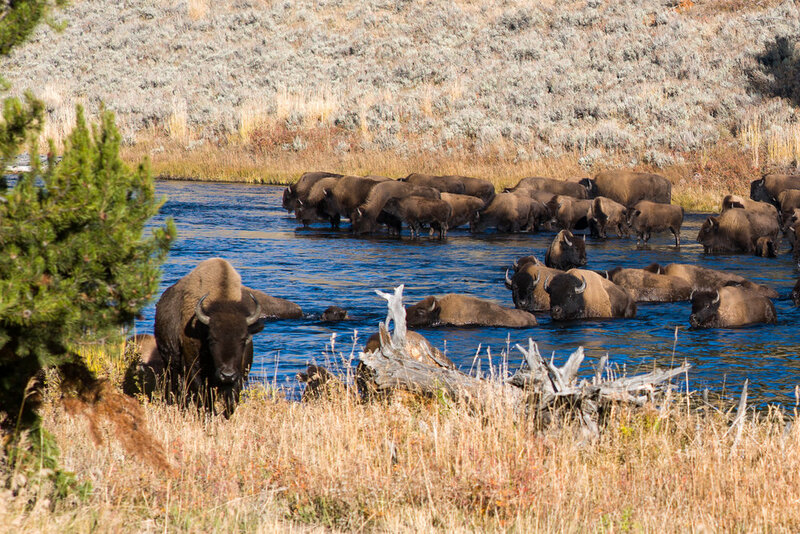 Now, elk herds forage over much vaster territory and are healthier as a result which allows vegetation to flourish in the river valleys and helps beavers build dams to provide a habitat for more wildlife. Check out this interesting video on the wolf reintroduction and the ecosystem with over 32million views on YouTube. A now-popular pastime and passion evolved in tandem with the wolf reintroduction - wolf tracking. 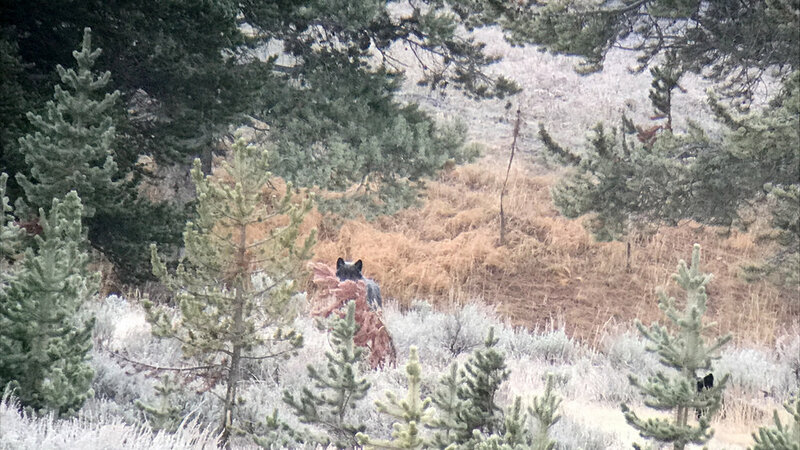 Wolf tracking or watching in Yellowstone is BIG! 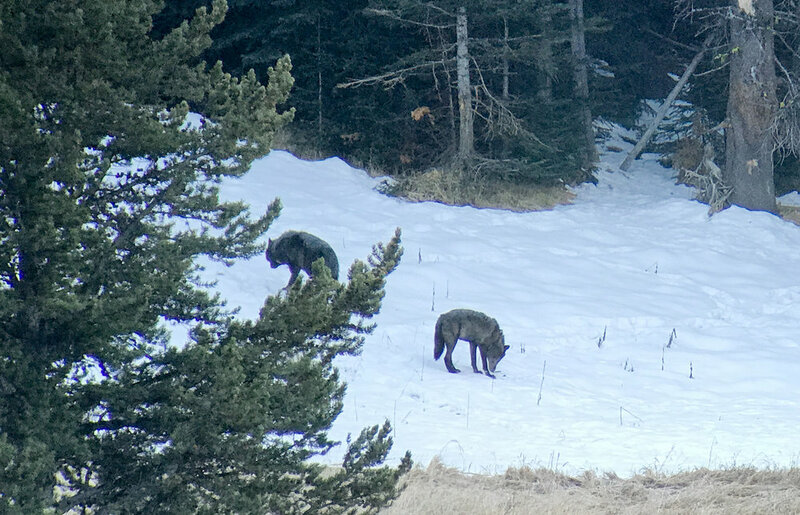 Rangers, park guides, expert and amateur wolf aficionados along with a huge contingent of retirees and frequent visitors meet often in the early morning at unofficial viewing locations of recent wolf activity and share recent sighting information. We were fortunate to be part of this gathering and immediately noticed the protective and nurturing attitude of the wolf trackers. The reason they show up day after day is because they care deeply about the Canis lupus. Well meaning friends warned us to be careful and keep our distance. The warning was unnecessary. Wolves are elusive and have no interest in humans. The distance between us was always 1/2 mile or more. If humans try to get up close, they move on. Ronan Donovan, a biologist turned photographer and filmmaker, explains "wolves are by nature more wary of anything new in their environment—even the slightest reflection from a lens could scare off an approaching wolf.” Watch his 2016 National Geographic video. At 6:25 am on a very cold, clear, early October morning, we met Leo Leckie, respected Yellowstone wolf tracker with Yellowstone Wolf Tracker. The plan was to locate, observe and photograph wolves. Wolf trackers bring lots of gear like spotting scopes, tripods, cameras, binoculars, bear spray and radios to communicate with other trackers. At the Hayden Valley overlook, Leo set out 3 spotting scopes on tripods and aimed them in the proper direction. 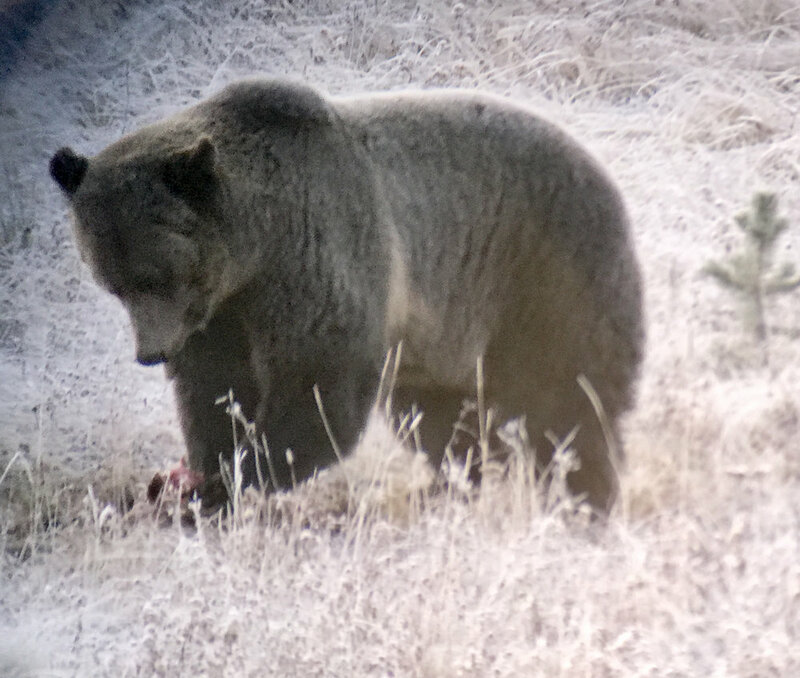 The immediate reward was viewing 2 frost covered bison and 1 grizzly bear. Not bad but no wolves. Leo's radio started crackling. 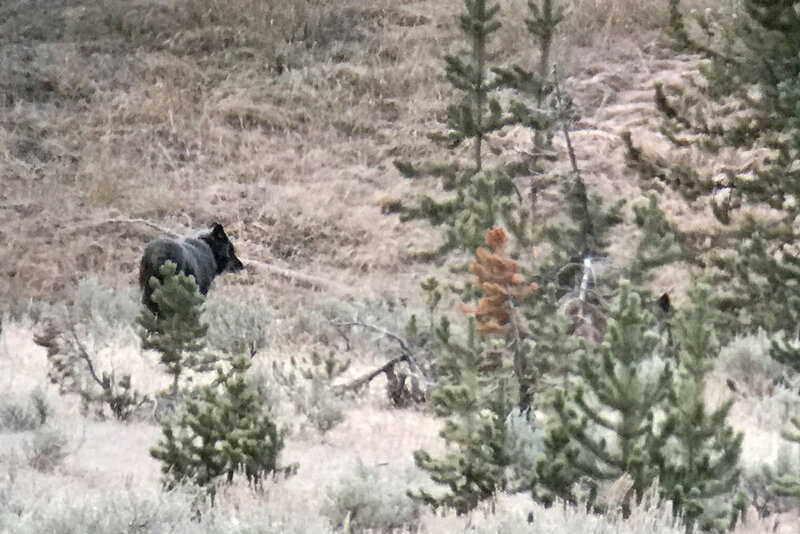 “90 this is 156” (tracker codes) just spotted the white alpha female (of the Wapiti Lake Pack) and 2 black wolves. Leo stashed the scopes and we were off. 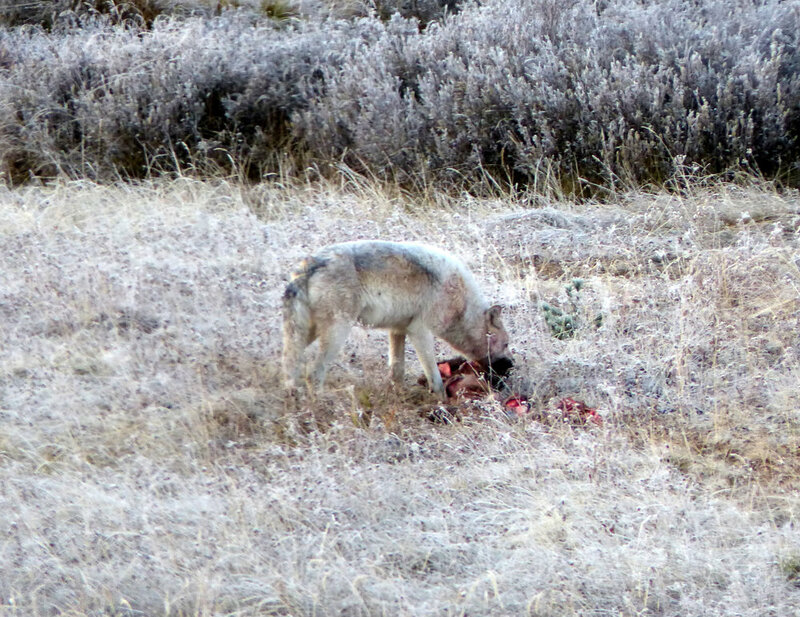 As soon as we rounded the bend to Cascade Meadow, off to the left and 100 feet from the road was the beautiful, large, white alpha female wolf feeding. Leo impressed on us the urgency to quickly capture the moment because the female would leave once a couple more cars stopped. Sure enough, the white wolf soon trotted off toward the tree line behind her. And within moments a grizzly bear appeared to scavenge the carcass. Wow! And then another grizzly who was close by decided the carcass was his. 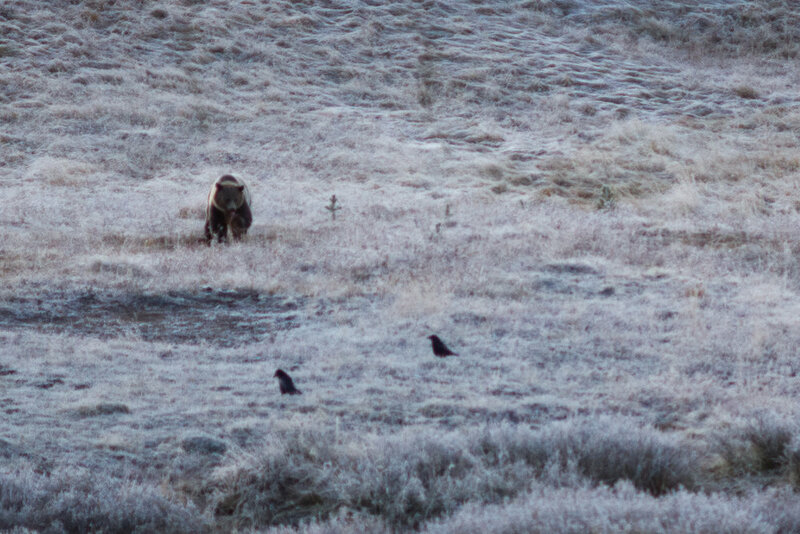 Then the ravens came in to try and steal any scraps they could from the grizzly. We were watching nature do what it naturally does and it was mesmerizing! Then, a couple watchers spotted the 2 black male wolves in the snow field up the hill. They were bedded down surrounded by trees. Using the scopes we observed them occasionally moving around. We also caught a few glimpses of other wolves. What a unique experience watching bears and wolves is. For awhile the wolves were visible. We continued to our observation and were rewarded with sighting from time to time as 1 or 2 would re-emerge. After a bit, they simply disappeared. Without Leo and the other trackers, we would not have seen this much wildlife in such a short time. We relocated to a couple different vantage points hoping for another glimpse but the wolves vanished. The wolves were gone but the memories will remain with us forever. During the course of the morning Leo skillfully and safely guided us and showed us things we would never have seen. He was happy to share his extensive knowledge of the park and the wildlife that make it their home. His vehicle was fully equipped with radios, knowledge and spotting scopes. He provided a wonderful breakfast spread with fresh fruit, muffins and yogurt for us. It was truly a joy to meet Leo and spend much of the day together. We highly recommend Yellowstone Wolf Tracker and especially, Leo! The wolves were too far away for the camera gear Rick uses. To find the wolves you need a spotting scope, binoculars, lots of patience and guidance about where to look. To photograph the wolves requires a very long telephoto lens. Leo's spotting scope allowed for a connected iPhone to capture images. These photos give you a feeling of what looking through the scope is like. The current wolf park population is around 100 adults in 11 packs. The Yellowstone Wolf Project monitors, maps, and tracks these wolves as they move through the park. They have an interesting site where people can log their wolf sightings. Pack size ranges from 3 to 20 adults. Pups aren't included in the count due to their high mortality rate. 24 adults have been "collared" over the years which aids in monitoring. 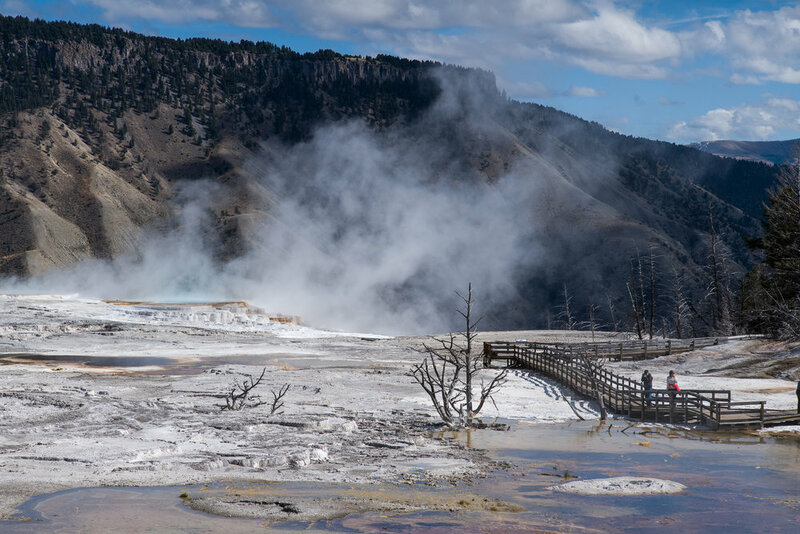 Inside the park there are many campgrounds and 4 grand hotels, the Mammoth Hot Springs, the Grand Canyon of Yellowstone, the Yellowstone Lake and the Old Faithful Inn. 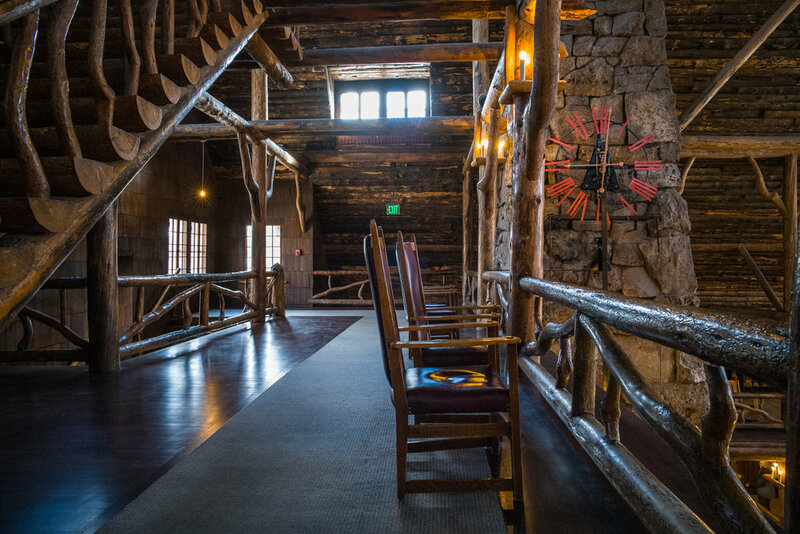 If visiting National Park Lodges is on your list, the Old Faithful Inn is likely in your Top 5. In order to secure a reservation, you need to book a room 6 to 12 months in advance of your visit. 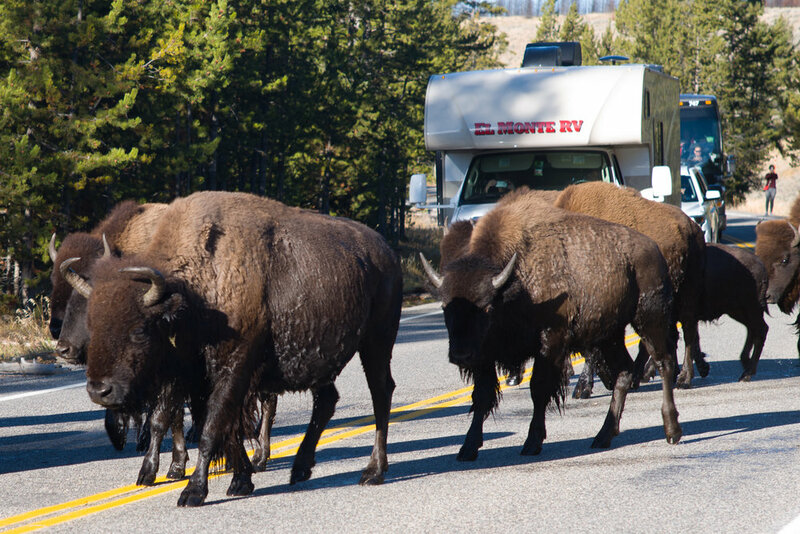 Yellowstone is currently a tour group favorite and is bulging at the seams with visitors. The Yellowstone Insider explains "As one of the first examples of “parkitecture”—a style of building that sought to blend with the landscape while still offering visitors a refined experience—the Old Faithful Inn has exerted immense influence on National Park Service architects and adorned imagination of visitors." Today visitors approach the Inn on the same road used by stage coaches in the late 1800s. A steep, bold roofline with many flags greets you. 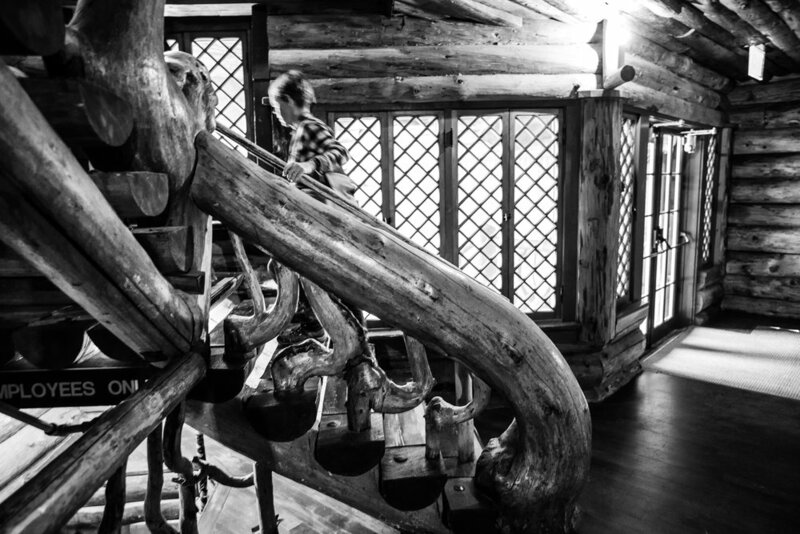 Bright red wooden doors lead to an interior lodgepole forest with a treehouse at the top of the Inn's rafters. Some say the intense architecture is rusticity gone berserk. 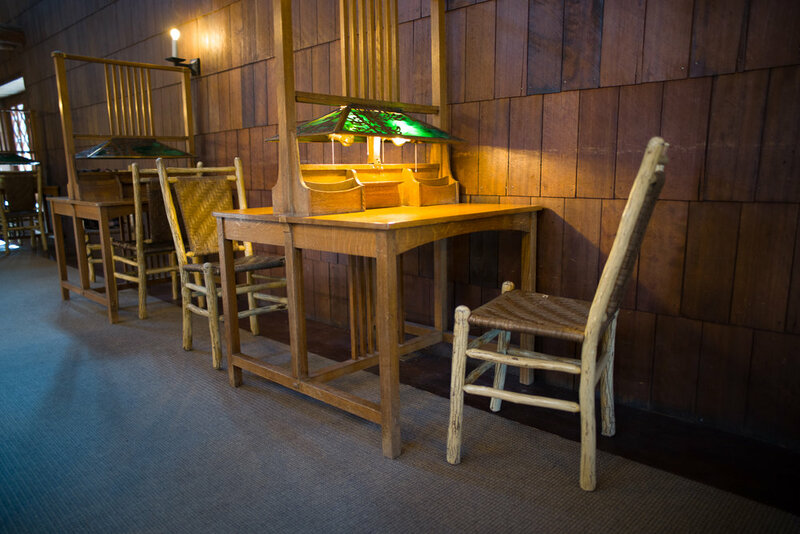 40 skilled craftsman built the Inn in 14 months. These same men built the railroad bridges that cross the park's mountain canyons. 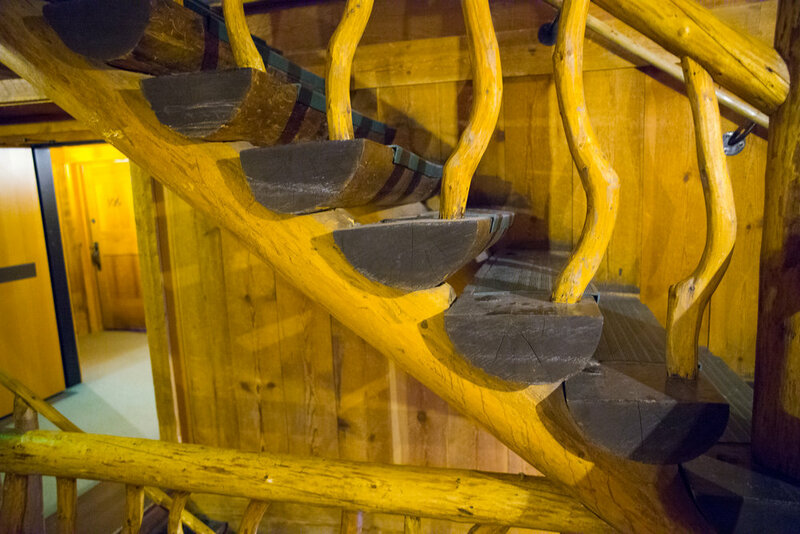 Gaze upon the lodgepole rafters and you notice a striking similarity to the wooden railroad trestle. 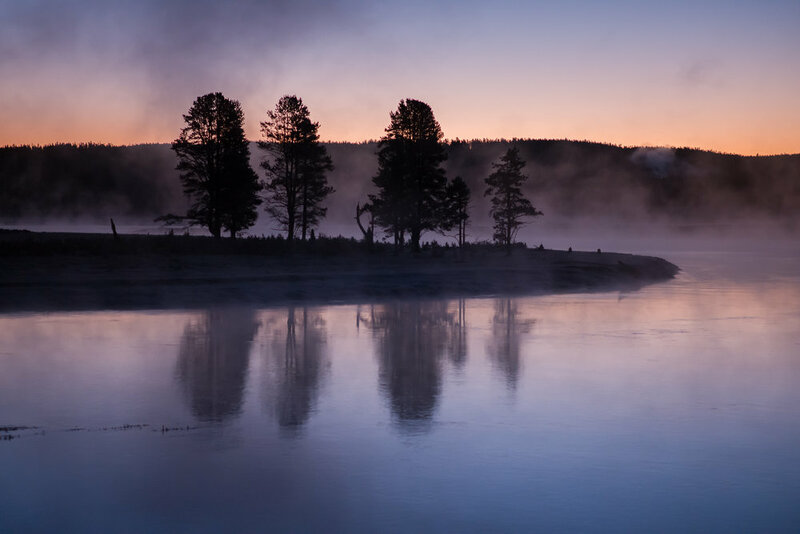 The Inn was declared a National Landmark in 1987 and recognized as an important relic of Yellowstone’s development from a far-flung wonderland to a premier visitor destination. Do these rafters look like a railroad trestle? Another National Historic Landmark is the Yellowstone Lake Hotel built in the Colonial Revival heritage style with massive white columns and a bright yellow exterior. 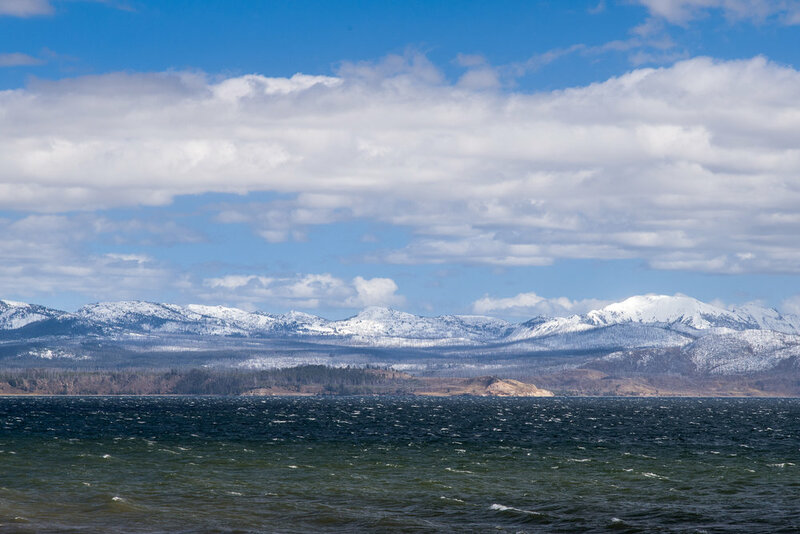 The hotel sits at the edge of Yellowstone Lake which has 110 miles (180 km) of shoreline. These hotels are worth a visit even if you don't stay overnight. There are frequent free tours lead by the park service if learning about their history is of interest. We had no trouble booking a room at the 1872 Inn which is located in West Yellowstone which is right outside of the park. New, small (our preference since this guarantees no large tour bus groups) and clean, the 1872 is family owned. We had no difficulty extending our trip 2 additional nights. Traveling with kids? Check out their other property, Moose Creek Inn and is close by. If you are the adventurous type, perhaps glamping at under canvas is for you. During the 2017 summer season, 75 tents were in use. Unfortunately, under canvas was closed in October so we can't provide a review. We hope to check them out next season. Glamping is high end camping so prices are in line with hotels, especially if you want running water in your tent! 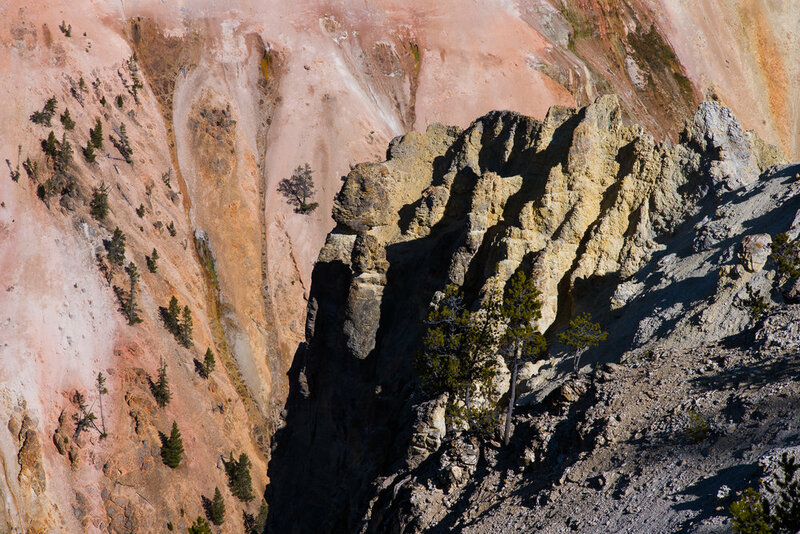 Yellowstone continues to evolve. The wolves are back. The elk are sleek and healthy. And people continue to be inspired by the park's diverse natural beauty. Over the past 10 years visitor numbers have exploded during the short tourist season so visitor management and education are current challenges. Upwards of 30,000 people visit Old Faithful each day in July and August. Tip - Get to your destination early (before 9 am) or shortly before sunset. Regardless of where you stay, someone in your group will be driving for hours to get to geological features and points of inspiration. So plan for long chunks of time on the road and be sure to thank your driver! If you want to learn more about wolves, Leo Leckie has created an interactive accessible family tree of the Yellowstone wolves! Presented for your internet and mobile access is the bloodline and life story of your favorite wolves, including origins and descendants. From the founding wolves in Canada and Montana during the mid-90s to those living and visible on Yellowstone’s landscape today, this is your source! If you're not yet a guest and want to become one, go to www.wolfgenes.info and follow the instructions on the Ancestry page/tab." 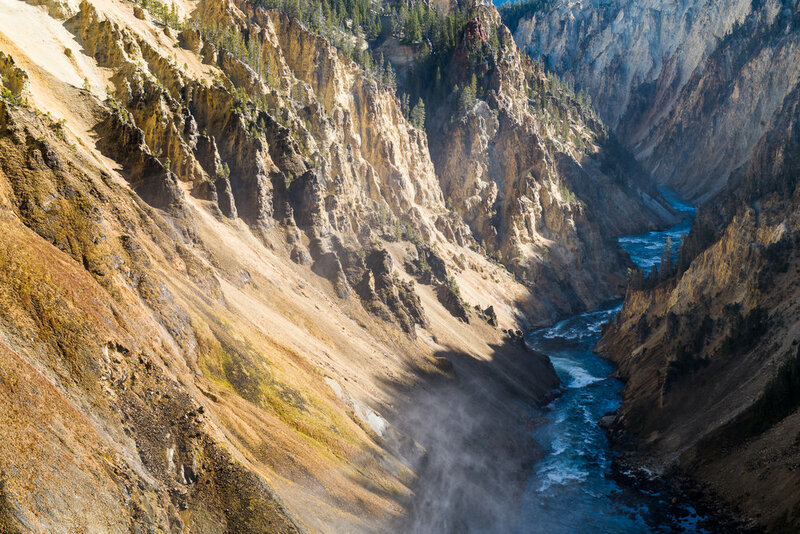 Yellowstone is magnificent and beautiful. 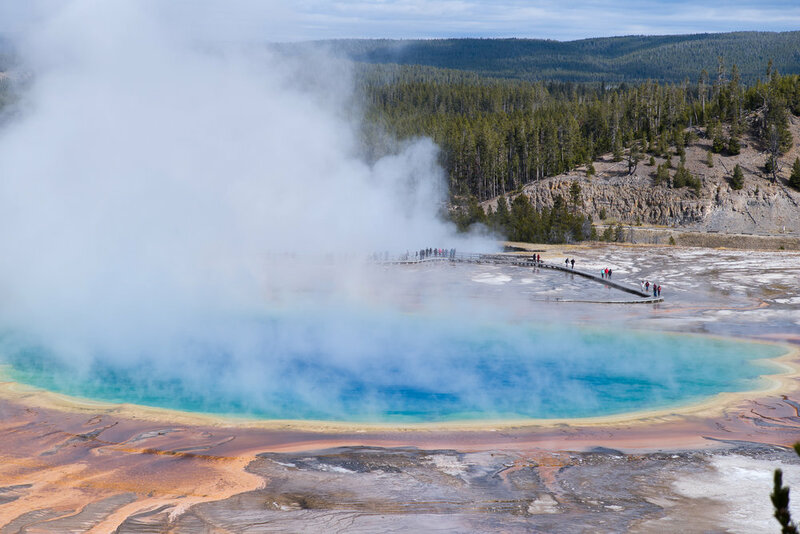 Within the borders of Yellowstone National Park are rivers, lakes, mountains, geysers, mud pots, hot springs and wildlife unlike any other place on earth. Beauty is too small a word to describe Yellowstone. The Grand Teton National Park borders Yellowstone on the south with its own spectatular beauty. 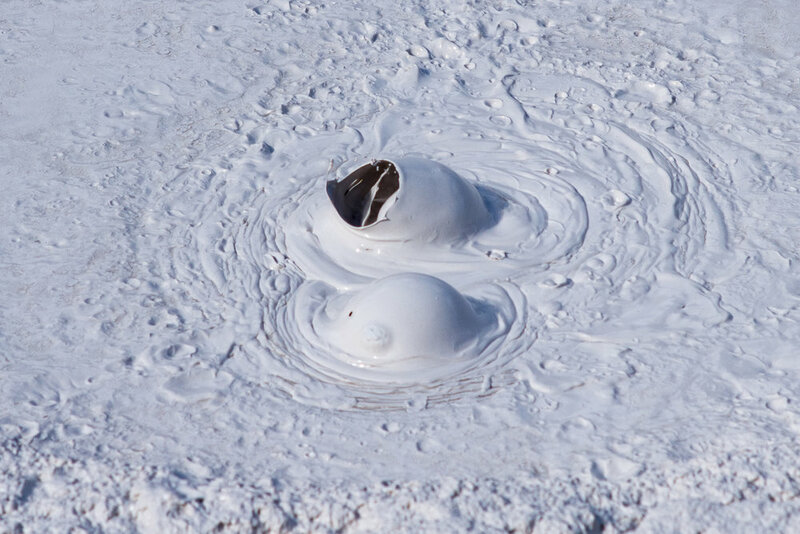 Please enjoy the images of the natural beauty of Yellowstone. 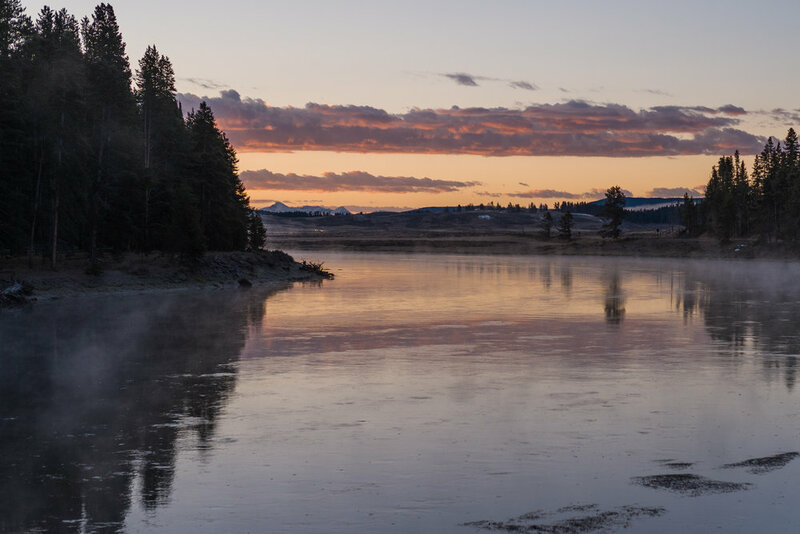 For more, check out our photo gallery for more images of Yellowstone and the Grand Tetons in Autumn.